The Menu Express printed Business Cards. *All business cards are 16pt / UV coated. 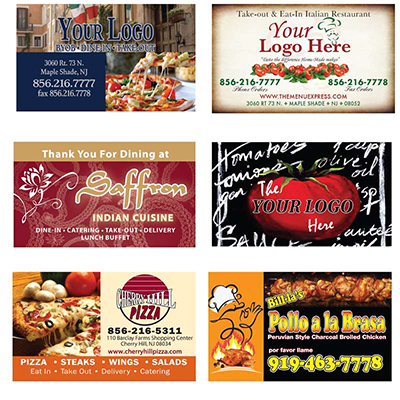 Make your best first impression with high impact quality business cards from The Menu Express. Business cards provide contact information in a universal standardized size. While much of the information is the same from one business card to another; font, style, colors, our imagery sets you apart and makes your impression unique. Full-color double-sided business cards are a great way to show your potential clients that you mean business! Printed in full color on both sides with your choice of UV coating on both sides are one. Get compliments on your business cards! Business cards can also be used as loyalty cards and discount cards. Customers pay more attention to full-color, high impact business cards! Call us toll Free at 877-250-2819 today to order your business cards or receive a FREE estimate. Or you can click here to contact us. To request your quote for Business Cards, simply complete this form!